Folks often ask me — Adam, they ask, it’s great that you make all of these lacto-pickles, or fermented vegetables, or whatever. But what do you do with them once you have them? And then they’re disappointed, and they make a face, and their curiosity kind of turns off when I tell them the truth — that mostly what I do is eat them for breakfast. Straight-up. Without any additional preparation at all. So I’ve been thinking about other things I can do with lacto-pickles — or at least other things that I can tell people that they should do that won’t disappoint them, or weird them out, or abruptly end the conversation. And that’s how I came up with this salad. A little while ago, as you might recall, I posted this recipe for pickled watermelon radishes. They were the ones that smelled so — well, they stank as they fermented. They’re delicious — sweet and savory and a little bit piquant — now that they’re done. 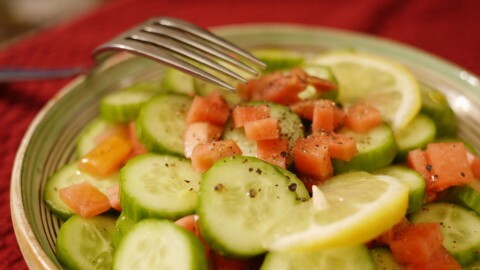 And diced, and tossed with slices of seedless cucumber, they make a perfect salad. It’s invigorating, and cooling, and — once it finally warms up — it will be a great early-summer treat. No instructions necessary. Just toss, then plate, then eat.